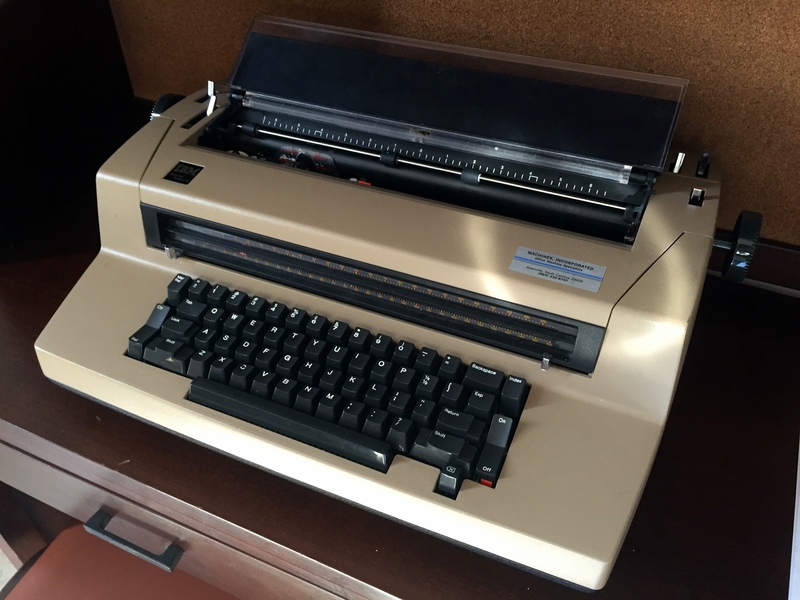 A year or so ago I found an electric typewriter headed for the trash and put it in the big room on the children’s hall at church where they gather to play air hockey and ping pong and eat doughnuts before Sunday school starts. I hoped that once they figured out what that crazy antique was (where’s the screen that goes with it?) they might enjoy tapping around on it, even typing a prayer to God. So I hung up this sign and waited to see what might happen. Sure enough, the kids lined up like we were giving out free Snickers bars. We had to come up with a time limit and give fifty thousand instructional sessions on how to load it with paper and make the carriage move (isn’t carriage the thing with horses, Miss Becky? This thing really is OLD!) and take the paper out. They loved it and even though I didn’t find reams of prayers laying around at the end of our Sunday mornings, it was a fun thing to have in the room. One day I found this. You know, I think this actually is a prayer. The child is professing her/his undying love for candy, with exclamation points, hyphens and commas for emphasis. It’s a thank you prayer, whether the child knew it or not. It’s a prayer that says I’m glad candy is in my life! I’m glad there is such thing as candy! I give thanks for candy and that my mom and dad let me have it. What would the world be without candy? Thank you, Universe! Thank you, God! Sometimes, when I’m lucky, I don’t have to squint to see the prayers hidden in photos. I see them poured straight from a child’s heart into that typewriter. Like this one. I happen to know who wrote this, and the child doesn’t have an easy life. What a privilege it is to see it and pray it with her. That settles it. The typewriter is staying. FOREVER. Even if nobody writes a prayer on it again. I hope your Thanksgiving is full of heartwarming, Facebook-worthy moments with people you love. And CANDY! PS. I LOVE it when things come full circle! While I was thinking about writing this post last night, I happened to watch a rerun of one of my favorite shows on television, A Chef’s Life. (Do you know this show? You should! Even if you don’t care about cooking- it’s not really about the cooking anyway.) You’ve got to check out how the peach episode ends! Vivian, the chef, is having a fake Thanksgiving (for a photo shoot in the summer) and asks her daughter Flo to do the prayer. PLEASE PLEASE PLEASE listen to this prayer. It’s at the very end, at the 23:32 mark. Love to you all! And Happy Thanksgiving!